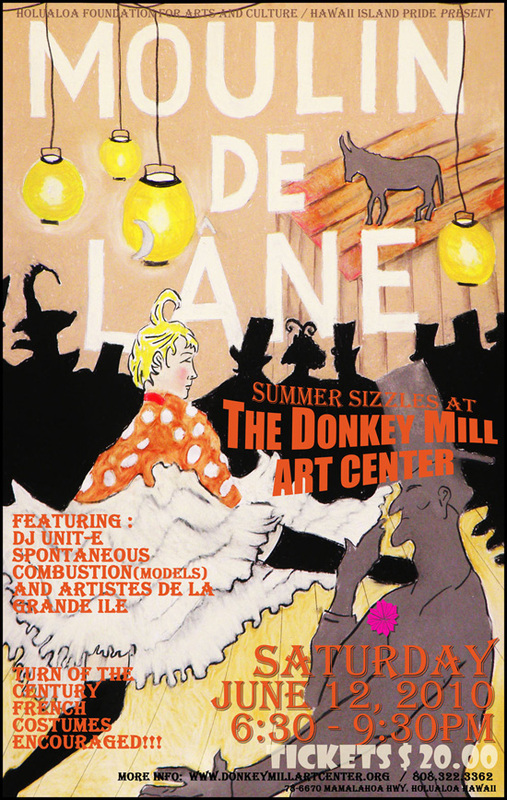 Bienvenue to an evening of art, music, and dance in a convivial atmosphere at Moulin de L’ane, a French bohemian inspired fundraising event slated for 6:30-9:30 p.m. Saturday, June 12 at the Donkey Mill Art Center in Holualoa. Tickets are $20 and turn-of-the-century French costumes are encouraged. The Donkey Mill Art Center will be transformed into the City of Lights for one evening. Artists and their muses will set the Mill ablaze with sketchy fervor as each artist produces drawings live before your eyes. Enjoy a glass of white summer sangria and nibble on opulent treats while witnessing creative geniuses at work or get inspired to make a doodle of your own masterpieces on paper serviettes in Toulouse-Lautrec fashion. Drawings from the event will be immediately presented along with additional artwork from local artists for purchase via silent auction. Proceeds will benefit The Holualoa Foundation for Arts and Culture’s (HFAC) educational programs and Hawaii Island Pride’s (HIP) Community Pride Festival. HFAC believes art education enriches the lives of people of all ages and abilities and seeks to fulfill this vision by providing a stimulating environment that helps individuals discover, develop, and expand their artistic abilities. HIP’s mission is to instill pride, celebrate unity, and embrace diversity. HIP strives to improve the lives of our local and regional LGBTQ community by creating visibility and promoting civil rights through education, networking, and celebrations that advocate equality. The historic Donkey Mill Art Center is located in Holualoa at 78-6670 Mamalahoa Highway. For event and ticket information, call 322-3362 or email hfac.dmac@hawaiiantel.net.